Navigation note: please click on the graphics to enlarge them in their own windows. 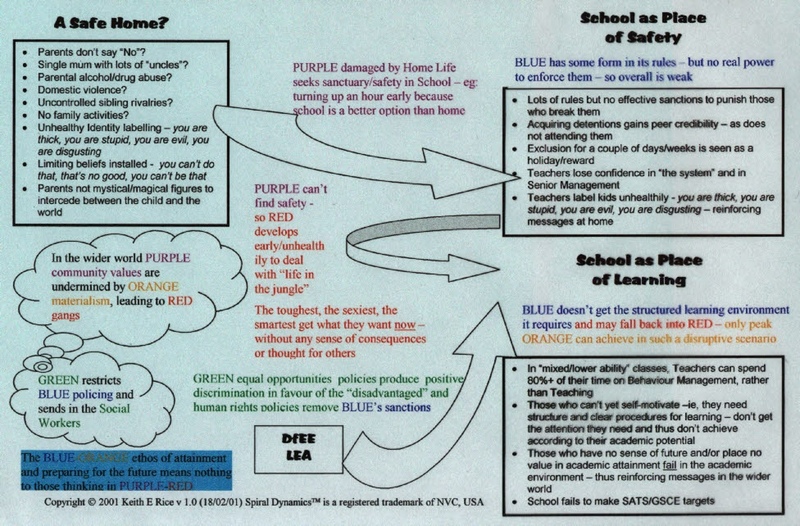 I created the above schematic way back in February 2001 to provide a MeshWORK analysis/Gravesian interpretation (meta-state) of the causes of bad behaviour in so many of Britain’s school classrooms. It is based upon my own experiences as a part-time teacher and discussions around that time with a range of teachers, including Kevin Beaton at (Kingswood High, Hull), Sheila Kaye (Whitgift, Grimsby), Angela Ogilvie (St Mary’s College, Hull), Steve Graham (Cleve Primary, Hull), Chris Massender (Westcliffe Primary, Scunthorpe), Cathy Byrne (Danepark Primary, Hull) and Jennie Beasty and Lynne Clarke (Shaw Park Primary, Hull). The schematic is, as these teachers pointed out, a generalisation and should not divert attention away from the many positive things going on in many schools. Nonetheless, the schematic does identify the roots of so many of the problems and how so many situations are compounded by the best of intentions. A Downward Spiral… was developed as part of a in February 2001 and was used by Spiral Dynamics co-developer Don Beck as part of his keynote address to the World Education Fellowship in Sun City, South Africa, that April. It has since become world-renowned as a first-class example of applying Gravesian ideas diagnostically. To address some of the issues raised in A Downward Spiral…, I also created the Potential Spiral Strategies schematic (below) as part of the same package of training materials. In part the strategies depicted are based on the work of Paul Edwards, then Headteacher of Knottingley High School, whom I modelled (using the Gravesian approach) for my NLP Master Practitioner training. In 5 years Paul had turned Knottingley High from being the worst-performing secondary school in the Wakefield District to being its best – his results being so impressive that the entire local Education Action Zone bid was built upon what he had done. Although he knew nothing of the work of Clare W Graves or NLP and did not in any way consider himself a psychologist, Paul acted as if he understood the principles intuitively. 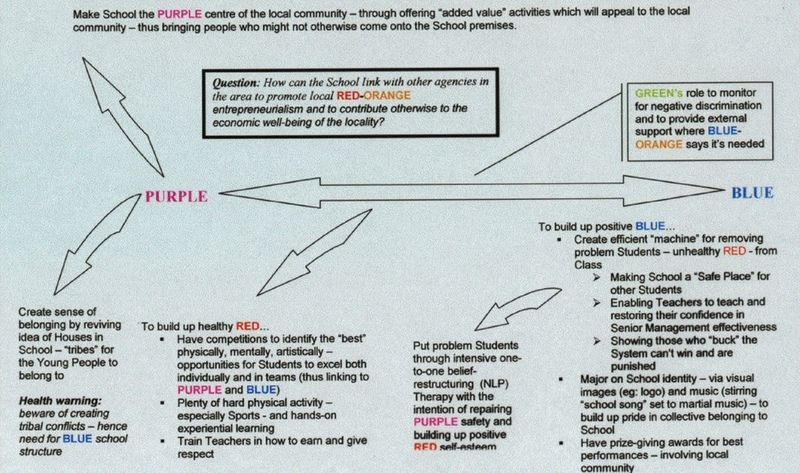 In essence Paul developed a full MeshWORK approach by linking with community bodies and external agencies to address those issues outside the school’s immediate control but which nonetheless were impacting upon it. I got to try out some of these ideas in acting as a consultant to Cathy Byrne in her merging of Shaw Park and Danepark – see The Parks.